A chipped bone may sound better than a broken bone but actually the two are not too far apart. 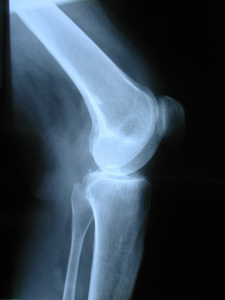 A chipped bone is actually a type of fracture where there is a chip--a piece of bone has broken off of the main bone. Chipped bones usually happen on all of the extremities, such as a chipped bone in the ankle, hand, elbow, finger, and places like these. A chipped bone can have many different causes. These can include all types of trauma where a physical force hits a bone and is stronger than the bone. Because of the angle of the hit, you can experience a chipped bone instead of a fracture that breaks a bone into two separate pieces. Traumas which can cause a chipped bone are collisions, twists, blows and falls. There can be many reasons why some people are more at risk for a chipped bone than others. This can include people who, for many reasons, might be in a position where they are more apt to experience violence or accidents than others. Those at risk for a chipped bone also include people who are aging, have osteoporosis or weakened bones, were born with congenital bone conditions, or have had a decrease in muscle mass. If you have a chipped bone, you will experience some or all of the following symptoms: pain in the area, inability to use the limb (or other location of the chip), instability at the site of the chip, swelling, bruising and bleeding within the tissue, and possible numbness or shock. With any of these symptoms you need to get yourself to a doctor or emergency room for diagnosis and treatment. The first thing that will be done is an x-ray to try and find the location of the chip. Beyond an x-ray, it will depend on the location and severity of the chipped bone as to whether more tests will be ordered. It is possible that you might need am MRI, CT, or a bone scan. As for treatment, the same as with tests, a lot of it is determined by the size and location of the chipped bone. You may need surgery to repair the bone if the chip entails several pieces of bone. Sometimes the bone chip can move around and that also could require surgery. Something like an air cast can be used or in severe cases you might even need a regular plaster cast to hold everything in place. Healing of a chipped bone can take time, anywhere from a few weeks to several months. You will most likely be sent to physical therapy for exercises and work to strengthen your muscles or limb after the bone has healed. The surrounding muscles are usually bruised when you have a chipped bone. You can prevent chips and breaks by trying to stay out of situations where you could be at risk for an injury, eating a diet that has lots of calcium to strengthen bones, and by doing weight-bearing and strengthening exercises as part of your workout routine to stay healthy. Many patients who have chipped bones and other types of bone fractures are suffering from the bone degeneration caused by osteoporosis. If this is the case, you may benefit from medications as well as dietary changes. If you suspect that you might have a fractured bone, get yourself to a place where you can receive diagnosis and treatment. With a chip, you might see a bulge along the surface of the skin or even feel something moving around inside. Chances are it will be incredibly painful and you will also want to get medication for the pain and swelling.